Quote: Could there be a new culprit behind climate change? Leafcutter ants can cause the kind of spikes in nitrous oxide levels usually found in “wastewater treatment tanks or dairy cow manure lagoons,” according to a study published Thursday in Proceedings of the Royal Society B: Biological Sciences. These small but mighty bugs unintentionally created the largest natural nitrous oxide hotspots ever recorded in tropical forests, the researchers found. Scientists from the University of Montana came upon the discovery by accident while working on another project examining patterns of greenhouse gas emissions in Costa Rica’s rainforests. “And [then] one of our sites was completely destroyed when a leafcutter ant colony moved in,” lead author Fiona Soper said in a statement. They observed that the ants, which are seen throughout the Americas stripping leaves and marching toward their nests, create small underground garbage piles of leaves, which decompose and emit the greenhouse gas, nitrous oxide. The process is similar to what happens in landfills. The area around their nests had twice as much nitrous oxide as the rest of the forest. While the researchers didn’t go so far as to say that ants are actually causing climate change, they found it compelling that nature’s tiny creatures could manipulate their environment in such a powerful way. and not ants. Namely white male people. 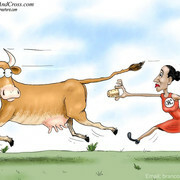 By the time AOC (or her handlers) gets done, there won't be any life of any kind on the planet if she wants to control climate. We may as well go ahead and nuke all life out of existence and be done with it. That's amazing about the ants; I didn't realize that.